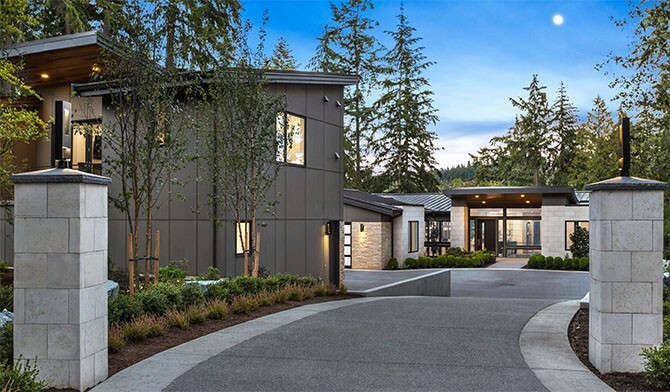 Nestled quietly behind the 4th hole green on the renowned Overlake Golf Course, lies a modern luxury estate situated on 100’ of golf course frontage. This fresh new design by BDR Fine Homes boasts over 7,700 Sq. Ft. and features 5 bedroom suites plus a den. The estate features a 5 car garage, large circular drive-court, and is situated on 33,000 square feet of immaculate grounds. The chef’s kitchen features professional grade appliances, an expansive kitchen island, and a separate prep-kitchen. Tailored for year-round entertaining, the signature outdoor living room features heaters, a fireplace, TV, and BBQ. The separate Carriage House features all of the comforts of home for your guests, including a full kitchen, living room, bedroom, and bath. and a trademarked GenSuite, complete with separate entrance, living, kitchen, bedroom, and bath. The Overlake Country Club is widely regarded as the top golf and family club in Western Washington; offering social, swimming, tennis, and golfing activities. The renowned city of Medina is home to industry leaders and is the wealthiest zip code in the state. The founders of both Microsoft and Amazon live within blocks of this modern golf course estate.